We take for granted the freedom we enjoy on a daily basis. Too often do we forget about the men and women serving overseas protecting us and millions of others unable to protect themselves. 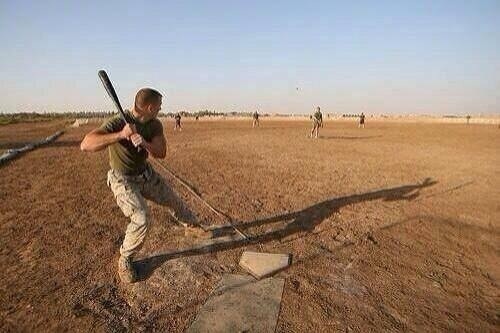 I thought this was a tremendous photo taken of a group of Marines playing baseball in Afghanistan. It’s great to think playing America’s favorite past time might make them feel right at home, no matter where they are. Very good picture. We truly do take our freedom for granted. One thing that unites us all is America’s pastime, baseball. Baseball can be a powerful sport and make you feel at home just as you said. What are the Mets and 710 WOR doing?